Looking for a keto change of pace – and some healthy veggies? 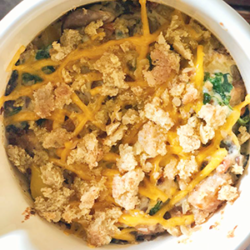 Stephanie Murico’s Creamy Vegetable, Chicken, and Cheese Casserole is full of fiber and flavor thanks to mushrooms, spinach, bell peppers and KetoVie Café Veggie Dip Mix. Add the oil, vegetables and chicken to a pan and sauté until the chicken is cooked and the vegetables are tender. Mix the mayonnaise and KetoVie Café Veggie Dip Mix in a bowl. Combine the cooked vegetables and chicken with the KetoVie Café Veggie Dip Mix mixture and mix until evenly coated. Place in an oven-safe dish and smooth the mixture so that it is even. Top with shredded cheese and crumbled Ketovie Café Wholesome Bread. Bake for 5-10 minutes until the cheese is melted and the bread crumbs begin to brown.